THE SINGLE CONSTANT that cuts across evening rises is seemingly abrupt change. Trout are doing one thing, you’ve figured it out, and you’re catching them fine. Then suddenly what you’ve been doing ceases to work, and on account of accumulating darkness, it’s almost impossible to figure out what has happened, and what to do about it. Close observation is almost always the key to successfully solving these situations. One of my favorite evening rises happens almost nightly in spring and early summer on one of my favorite high-desert ponds. It’s small, isolated, largely unknown and therefore ignored. 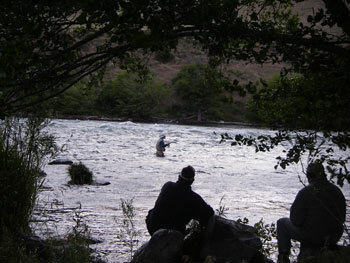 It contains some big trout, which makes its problems well worth trying to solve. The first time I encountered this particular evening rise, light had dwindled to a dim reflection of a red sky on the pond’s surface, where all sorts of mayhem was going on. I’d been doing fine all afternoon, fishing midge pupa patterns, specifically size 14 Zebra Midges suspended about a foot beneath chartreuse yarn indicators—I use the plural not because I fished the flies in pairs, but because the big trout cleaned me out so often that I ran through a dozen or so of those slender flies, tied to fragile 6X tippets, before evening came slowly on, and the trout suddenly wouldn’t have anything to do with anything suspended. I ran through the usual frantic litany of changes, then suddenly realized I was out there to enjoy myself, not flagellate myself. So I sat down on the bank of the pond, in the near darkness, and discovered I was in one of the most beautiful settings in the world. The sun had set behind the distant Cascade Mountains, outlined them starkly, blackly, from behind. The sky had turned as black as the silhouettes of those upthrust mountains. A patchwork of high clouds caught by the settled sun, and ignited red by it, reflected off the water, and gave the surface what little light it had left. The main defining thing I noticed on that still surface were almost continual black noses poking out of the water, sipping something. I had my constant binoculars, so I aimed them out among the rises, just to get a closer view of those trout. What I was able to see through them informed my fishing the next evening, and for a lot of evenings, on a lot of ponds and lakes, ever since. The surface was covered with small, dark midge adults, swirling, scooting, stopping to sit still, like size 16 balls of cottonwood fluff blown about on a breeze, only the pond was windless. British call them ‘buzzers’, and it’s easy to see why: their wings whizz, and they buzz along, right on the surface, sometimes leaving soft V-wakes that draw up much larger Vs made by trout calculating their trajectories. Without binoculars, I could see the trout, but not what they were taking. With binoculars, I could follow the flight of a single midge, etched against the slightly red-shining surface, among hundreds or thousands of its kind, until its adventure got punctuated by a black nose arisen. It was too late to do anything about it that evening. The next day, before hitting the pond with the usual, and as usual successful, suspended midge pupae, I set up the portable tying vise in the tent trailer, and tied a half dozen size 16 Adams, but with extra hackles palmered over their bodies, to aid in the buzz. When the same set of beautiful evening conditions arrived, and the same trout suddenly disdained my pupa patterns, I switched to a long tippet and one of the buzzers. I began calculating the trajectories of the trout themselves: plotting the direction of their rises as they set their sights on the buzzing midge adults: one rise, two rises, set the fly where the next would be. I’d draw the fly a foot over the surface, then drop the rod tip, let the fly sit still. Satisfyingly often, that plotted third rise would occur, and the reflective surface of the pond would be destroyed by the cavorting of a trout. I took one throat pump sample before quitting, from a three-pound rainbow, squirted the contents into a vile filled with alcohol. When I examined it in the light of the next day, the dividing line in the trout’s feeding pattern was clearly defined. 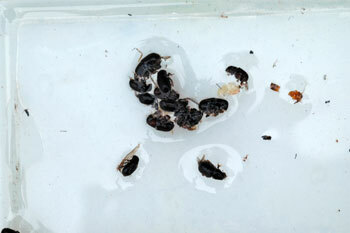 It contained perhaps two dozen midge pupae, in states of digestion from almost pulp to fairly fresh. It also held a dozen or so midge adults, all perfectly preserved: all freshly taken by the trout before I caught the trout, robbed it of its dinner, and pickled those midges in alcohol. It was easy to see almost the near-night moment at which the trout had turned its attention from pupae to adults. Many evenings on waters like the Deschutes River, the air is full of adult caddis, and trout seem to be feeding on the surface. It’s sometimes true, but more often, the caddis are diving down to lay their eggs, and trout are taking them just sub-surface. Another puzzling evening rise happens on the Deschutes River, in late June and on into July and even August. You’ve fished those quiet nights, when the wind has finally dropped to nothing, and the air is filled with caddis adults. They buzz around, so many of them chasing each other’s tails that they form halos in the air over treetops, above sagebrush tops. Just as many of them fly out over the water, and it’s easy to see they’re getting onto it, and trout are rising to take them. You know enough about entomology to know they’re Hydropsyche, spotted sedges, and that a size 14 or 16 Elk Hair Caddis is the perfect match for them. 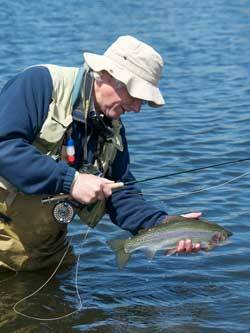 In fact, like me, you’ve been fishing the edges all day with just that fly, and have been doing very well with it. But evening comes on, and the Elk Hair suddenly ceases to interest trout. Those splashy rises, it turns out, are indications of sub-surface feeding, not feeding on top. 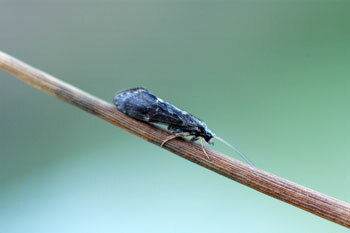 The caddis adults belong to a brand that lays its eggs under the water. They fly above the water, usually where it’s somewhat calm, then they dive, poke themselves through the surface, and begin stroking toward the bottom, to get a grasp on rocks or logs down there, and then to hold on and patiently deposit their eggs. Trout are acutely aware of what’s going on. They hold high in the mild currents, and take the diving caddis adults so near the surface that their rises break through to the top. It looks like they’re taking the adults dry. It’s also not clear that this adult activity stands alone. 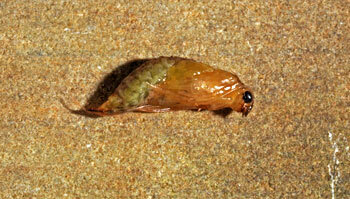 Many times, it seems to be mixed in with an emergence of pupae of the same species. I’m not certain of this, because I’ve never ceased casting long enough to take a throat sample during fishing that is so good…once you’ve managed to figure out that the solution is a wet fly or nymph, not a dry. Then it suddenly becomes easy. The solution can be as simple as suspending a wet fly or pupal pattern right off the stern of the dry fly you’ve been fishing, on about eighteen inches of 4X or 5X tippet. That way you’re offering trout a choice, and you can easily see which fly they prefer. It also lets you determine exactly when the switch in interest occurs, from the surface to the area just beneath it. I’ve had better fishing by removing the dry fly, replacing it with a wet or nymph, and fishing the subsurface fly on a very slow mended swing. That might reflect my preference for fishing old-fashioned wets, however, and also for fishing with the minimum number of trinkets, such as strike indicators and split shot, on my leader. I’m not opposed to any of that; it’s just that if I can avoid it and still catch what I consider my share of trout, I’m happier without them. So I often swing a size 12 to 16 Hare’s Ear winged wet fly, as an imitation of the swimming adults, or a size 14 to 16 Gold Ribbed Hare’s Ear nymph, as an imitation of the rising pupae. 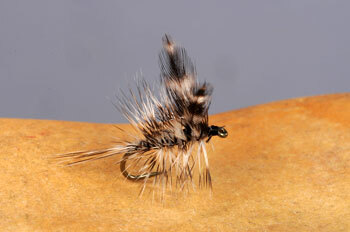 I’ve never found myself doing poorly if I switch to a size 14 or 16 Beadhead Hare’s Ear Pupa. 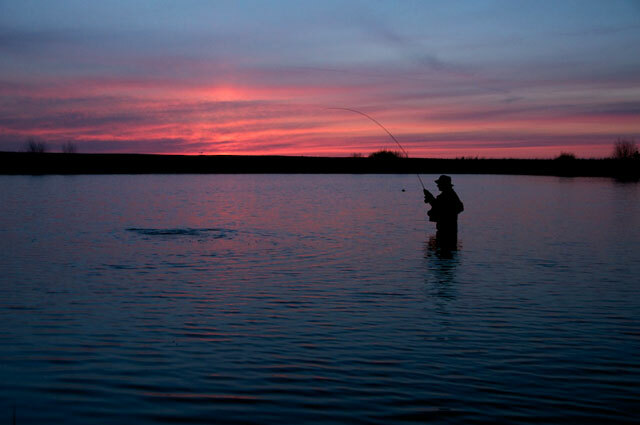 The key, in the face of this evening switch in the trout’s attention from surface fare to sunk stages of the same insect, is to switch yourself: from floating flies to those that sink and swim. Another difficult evening rise happened to me the first time on Fall River, a spring creek in central Oregon that flows through dense stands of jackpines. 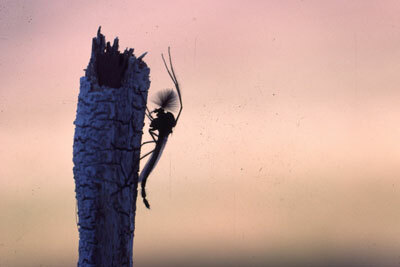 It was a warm mid-summer day, and various mayflies had been coming off almost all day. 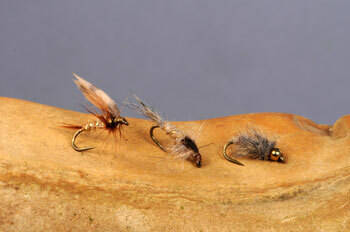 Trout would focus on a few lesser green drakes, and I’d use a size 14 Olive Quigley Cripple to catch a few of them. Then they’d switch to a scattering of pale morning duns, and it was easy to read the situation, change to a size 16 PMD Compara-dun, catch a scattering more. In the afternoon, a scant hatch of size 20 BWOs prodded a few trout into rising. It was not an easy situation to solve, because the naturals were so few and so small, and the trout rising to them so careful and concealed in their sipping. But the duns were visible, and it was not difficult to match them with a tiny Olive Cut-wing Parachute. A scant few trout were happy about that. Then it became evening, and the game abruptly changed. All the duns were gone, but the trout continued rising. But it was in a strange pattern, and I couldn’t fathom it, nor could I see anything on the water to prompt it, until I realized a flurry of rises would erupt quickly every time a breeze wafted through the pines, then subside a few minutes after the wind died down. I stopped fishing, lay on my belly, and peered over the edge of a grassy bank, onto a long flat beneath a stand of trees. It took no time at all to notice a few trout rising the length of the flat, but a long time to notice that they were taking tiny bark beetles awash in the surface film. Then it all made sense. A wind would hit the trees. The branches would sway. A cascade of the beetles would fall to the water. The trout would feed on them eagerly, but with the tiniest of sipping rises. When they’d cleaned the beetles up, the rises would cease, and would not begin again until the next breeze batted the trees, delivered new provisions. I tied on a size 20 Black Crowe Beetle, tied with dyed deer hair, and began fooling a few of the trout in the failing light. But it was impossible to see the fly on the water, and after a fish or two the cranky fly would be impossible to keep afloat, and I’d have to change it out. When it became too dark to do that, I was forced to quit. 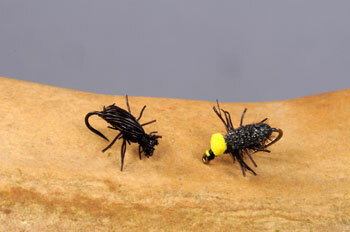 Since then, though, I’ve switched to the higher-floating Black Foam Beetle, with its little yellow foam marker, and have been able to do better whenever such situations arise. It’s become such a common phenomenon that I now go right to a tiny foam beetle whenever trout sip but I can’t see what they’re taking. I always suspect beetles. I also often suspect that the trout are taking something else, heaven knows what, but they’re willing to accept a beetle pattern even when that’s not near what they’re engaged upon. Bad luck for them. If they’re willing to take a beetle pattern, I’m more than willing to furnish one. From the June/July 2011 issue of HookedNow, the new online e-zine by Dave Hughes, Rick Hafele, and Skip Morris. For more information and a free issue go to hookednow.com.